Endemic to parts of the Upper Amazon in Peru. Several sources also include the Nanay and Maranon basins, and Colombia (Amazon, Japura and Caqueta basins) and Ecuador (Napo basin). Type locality: Río Morona, upper Amazon River basin, Departamento Loreto, Peru. Inhabits dense patches of marginal vegetation in streams, creeks and river. It’s also found in large numbers on the floating mats of vegetation commonly known as “floating meadows”, which provide a haven for many fish species. Ideally keep it in a heavily planted setup with broad-leaved plants, driftwood branches and, if you wish vertical rock surfaces. The choice of substrate is not hugely important as the species spends most of its time away from the bottom of the tank but a sand substrate seems appreciated when the fish descends to browse. It feeds primarily on algae and other microrganisms in nature. In captivity the bulk of the diet should be composed of vegetable matter in both fresh (courgette and cucumber slices, blanched spinach etc.) and dried (algae wafers, spirulina tablets etc.) forms. Although it will also accept small live and frozen foods such as bloodworm or daphnia, take care not to feed these too often, as it doesn’t require a great deal of protein in the diet. Very shy and retiring, to the point that it will be out-competed for food by more vigorous species. It’s best kept with small, peaceful characins, dwarf cichlids such as Apistogramma and smaller Corydoras. Like others in the genus, it prefers the company of conspecifics and you should aim for a group of at least 6. Most easily sexed by looking at the fish from above. When viewed like this, mature females appear broader in the body. Has been achieved, but unfortunately very few details are available. Spawning occurs in a similar style to Corydoras species, with the fish forming the classic ‘T’ position, in which the male grasps the female between his pectoral fin and body and eggs and sperm are deposited. Unlike in cories the eggs are scattered randomly around the tank, usually among plants in the upper areas, or on the tank glass. Various factors appear to be involved in triggering a spawn. Large weekly water changes with cool water seem to be important. It’s also been suggested that the presence of another breeding species in the tank (Corydoras are usually cited) may also play a part in stimulating spawning activity. The fry are very tiny and will require access to copious amounts of algae and other greenstuffs. This is one of the commoner “otos” seen in the hobby, and is likely the one most frequently offered as an “oto.” It is an ideal species for the planted aquarium. Unfortunately it can be quite delicate when first imported, and losses are not uncommon. This is usually down to lack of food, as it’s a small fish and needs to feed almost constantly, so it’s easily starved during transportation. As almost all otos are wild caught, they can be quite sensitive to water quality, too. Many hobbyists report fewer problems if the fish are added to mature, planted tanks, where water quality is stable and there is a plentiful supply of microorganisms and algae for the otos to feed on. Once the fish are past the initial stage and are feeding well, maintenance becomes much easier. You may observe otos suddenly dart to the surface for a gulp of air, very similar to the catfish in the Callichthyidae (corys, etc) family. Otos possess a modification of the esophageal wall that may function in aerial respiration and assist in providing additional buoyancy that aids these fish in remaining close to the water surface in their habitats (Schaefer, 1997). This species is frequently mislabelled in stores, usually as O. affinis or O. vittatus. Isbrucker et.al. (2001) proposed the genus Macrotocinclus for O. affinis and this has been accepted (Eschmeyer, 2015). The similarity between O. macrospilus, O. vittatus and O. vestitus has frequently confused hobbyists. O. macrospilus can be distinguished from O. vestitus by the markings on the caudal fin. O. macrospilus has a dinstinctive large round black blotch at the base of the caudal fin; on O. vestitus the horizontal black band extends onto the caudal fin with no significant enlargement into a blotch. 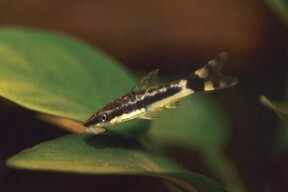 O. vittatus is another near-identical species, but the upper edge of the black horizontal band along the sides of the fish is bordered by a distinct white clear band separating theblack band from the mottled pattern; on O. macrospilus the white band is less distinct in places and on O. vestitus the mottled pattern adjoins the black band with no definable white band. In my opinion the smallest aquarium to be considered as safe for otocinclus spiecies should be at least 45 cm long, due to their sporadic energetic outbrusts. Although i can imagine having a group of 6 in 30x20x20 if the aquarium is equipped with powerful filtration creating a strong current. In my experience the 50x40x35cm aquarium was sometimes barely enough to keep the entusiastic breeding group. Hi Sverting thanks for the feedback, I’ve adjusted the tank size recommendation. This profile, like many on the site, is still in need of a full edit. Why aren’t there any other profiles for other Otocinclus species on this site? (‘cept for Cocoma) The O. vittatus is one that’s in stores a lot, at least add that one. Hi Danny the site is still very much a work in progress and we simply haven’t got around to covering Otocinclus properly yet. It’ll get done eventually but can’t promise when I’m afraid. I have 6’macrospilus’…which after many months of observation appear to be a 4+2 mix of different species (bang goes any future breeding group!). The line “Unlike in cories the eggs are scattered randomly around the tank, usually among plants in the upper areas, or on the tank glass.” is a little confusing as surely this is exactly what corys do as I’ve seen them lay eggs on glass/filter/pipes/plants/moss/snails….exact locations often depending on species size. Conversely I was led to believe from my research that otos and ‘non-otos’ (I also have Hisonotus leucofrenatus ‘black oto’ – another type not covered by a profile page) prefer to lay eggs on the underside of leaves as opposed to the corys tank wide scattering. Also add ‘can be’ to the “Very shy and retiring”?…mine vary between periods of hiding away as mere shadows during the day, to on occasion almost sunbathing at the front on the substrate regardless of the activity in the room.